The Arduino MKR WiFi 1010 is the new version of the MKR1000 with ESP32 module on board made by U-BLOX. The MKR WIFI 1010 is the evolution of the MKR1000 and is equipped with an ESP32 module made by U-BLOX. The MKR Wifi 1010 aims to speed up and simplify the prototyping of WI-FI based IoT applications thanks to the flexibility of the ESP32 module and its low power consumption. The design includes a Li-Po charging circuit that allows the Arduino MKR WIFI 1010 to run on battery power or external 5V, charging the Li-Po battery while running on external power. Switching from one source to the other is done automatically. A good 32 bit computational power, the usual rich set of I/O interfaces, low power Wi-Fi with a Cryptochip for secure communication, and the ease of use of the Arduino Software (IDE) for code development and programming. All these features make this board the preferred choice for the emerging IoT battery-powered projects in a compact form factor.The USB port can be used to supply power (5V) to the board. 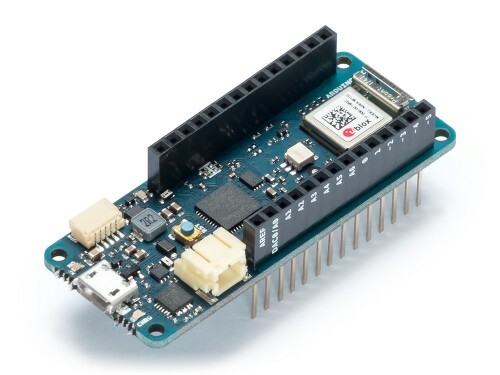 The Arduino MKR WIFI 1010 is able to run with or without the Li-Po battery connected and has limited power consumption. Warning: Unlike most Arduino boards, the MKR WIFI 1010 runs at 3.3V. The maximum voltage that the I/O pins can tolerate is 3.3V. Applying voltages higher than 3.3V to any I/O pin could damage the board. While output to 5V digital devices is possible, bidirectional communication with 5V devices needs proper level shifting.